In May 2010, the Student Association, Inc. (SAI) continued its legacy of student support by purchasing a 94 acre former dairy farm adjacent to Roadman Park. This purchase drastically increased the opportunity for academic, recreational and meeting space at California University of Pennsylvania. This property is now known as the SAI Farm. Formerly an old residential family home, the Farmhouse was renovated and expanded into meeting and banquet space in 2011. It now offers three smart style conference rooms along with a larger rustic banquet hall. The Farmhouse provides a unique venue for student meeting and events. Two pavilion and picnicking areas are called for in the master plan, both in the same architectural style as the farmhouse. The first is planned near the gardening space just above the barn and will also have an area to accommodate volleyball and other outdoor games. The second will be at the highest elevation of the property and will take advantage of scenic views the SAI Farm offers. This facility will provide needed practice space for the University Golf Team. It will also provide them the opportunity to host training clinics for local area school districts. The facility will have 14 stations, a few of which will be covered for year round access. The Department of Geology has partnered with the Pittsburgh Geological Society to host annual drilling workshops. Each year for several years during the event, a couple holes will be drilled at varying depths. Going forward this will provide invaluable hands on experience outside of the classroom and a source of hydro geological data for the students. 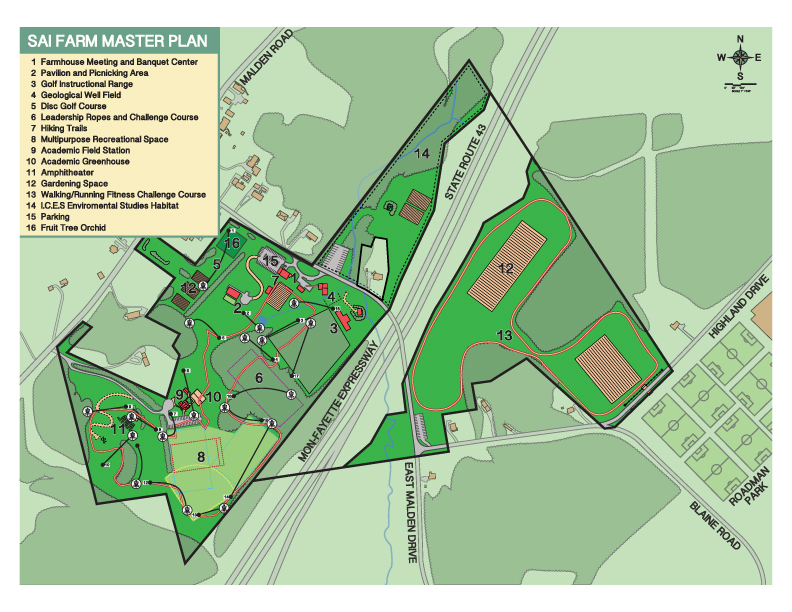 During the summer of 2011, the newly formed Disc Golf Club volunteered many hours designing and implementing a full 18 hole disc golf course throughout the property. 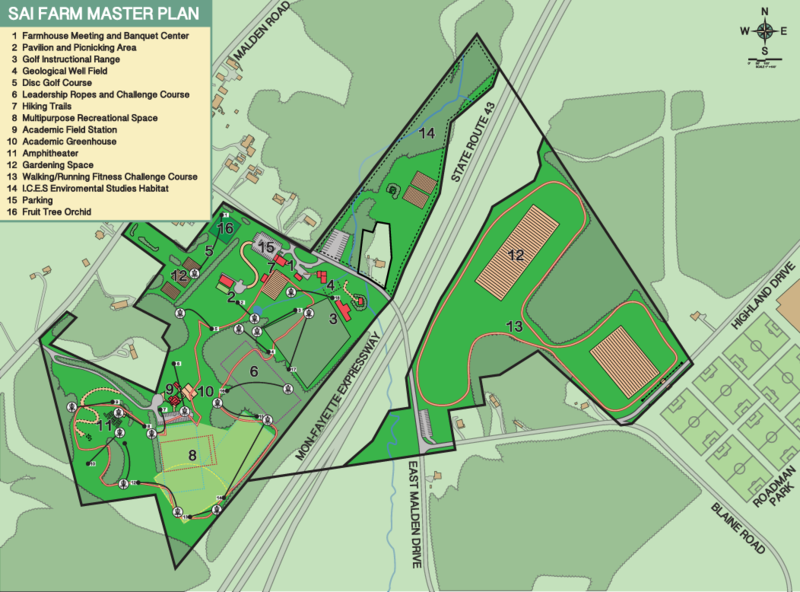 The course covers 60 challenging acres of varying terrain starting near the Farmhouse. The Leadership Programs at the University will be able to take advantage of hands on team building exercises and events locally. Benefiting from the varying terrain of the property, high and low ropes challenge course elements are planned just off of the various trail systems throughout the property. The Parks and Recreation Department and Student Club are helping to design and implement a network of trails throughout the property. The trail system will provide a way for student and community members to explore the property. Along the trails there are plans for signage that will identifying plant and wildlife. A large, flat open recreational space is located on the upper section of the property. This space can accommodate a variety of recreational or student activity events. The property will benefit various academic departments. A small facility is planned to accommodate their meeting and lab needs as they make use of the property. A greenhouse is planned to benefit the university science departments and potentially various sustainability initiatives with the local campus food service provider. A natural amphitheater has been placed at the upper peak of the property and would provide any audience with the phenomenal views of the area. This would be a small open stage air stage with intimate seating. Several areas are planned for gardening space throughout the property. The gardens benefit various academic and sustainability initiatives of the campus and offer a temporary location for landscaping plants. There are also plans for individual plot gardens. As demand for garden space grows, a retention pond is planned for the existing natural stream to help with irrigation needs. Adjacent to Roadman Park, a 1.5 mile portion of the Cross Country Teams course is found on the SAI Farm. The course is open as a general running/walking trail as well.